For other places with the same name, see Nowa Ruda (disambiguation). 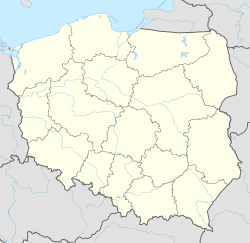 Nowa Ruda [ˈnɔva ˈruda] (German: Neurode) is a town in south-western Poland near the Czech border, lying on the Włodzica river in the central Sudetes mountain range. As of 2007[update] it has 25,240 inhabitants. The town is located in Kłodzko County, Lower Silesian Voivodeship (from 1975–1998 it was in the former Wałbrzych Voivodeship). It is the seat of the rural district of Gmina Nowa Ruda, but is not part of its territory (the town is a separate urban gmina in its own right). Situated in the rich Kłodzko Valley, the area of the modern town was settled in the early Middle Ages by Germans. Officially, the settlement was granted a city charter in 1363 and received the name of Newenrode. The city was rechartered under a local variant of the Magdeburg Law in 1434 and then again in 1596. Since then it has shared the history of the nearby town of Kłodzko (German Glatz). The town was the seat of Landkreis Neurode until 1932, when it was reincorporated into Landkreis Glatz. Following World War II the region became part of Poland, and the town took on its present name, with the German population being expelled. After the adoption of Ostpolitik by the German Chancellor Willy Brandt, the former German inhabitants were allowed to travel to their hometowns and tried to establish relations with the current population and the Holy See redrew the boundaries of the ecclesiastical provinces along the post-war borders. On 28 June 1972 the Catholic parishes of Nowa Ruda were transferred from the traditional Hradec Králové diocese (est. 1664; Ecclesiastical Province of Bohemia) to the Archdiocese of Wrocław. The area was notable in the Middle Ages as a source of rich iron ore deposits. Until 2000 there was also a coal mine and a gabbro mine in Nowa Ruda's borough of Słupiec. ^ Paulus VI, Constitutio Apostolica father/paul vi/apost constitutions/documents/hf p-vi apc 19720628 vratislaviensis lt.html "Vratislaviensis - Berolinensis et aliarum", in: Acta Apostolicae Sedis, 64 (1972), n. 10, pp. 657seq. This page was last edited on 11 February 2018, at 18:57 (UTC).